A shiny new garbage can made its debut last week on the southwest corner of North Highland and St. Charles avenues. 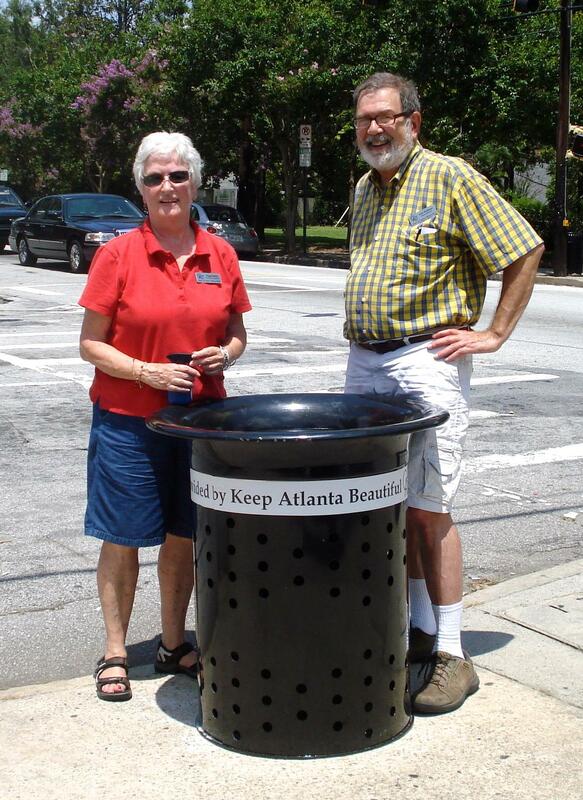 The new receptacle – provided by Keep Atlanta Beautiful and paid for by Atlanta-based UPS – is the first tangible byproduct of the efforts of a new neighborhood group that seeks to spruce up VaHi’s commercial nodes. According to its mission statement, Keep Virginia-Highland Beautiful is an informal group of volunteers committed to keeping VaHi an inviting and well-maintained neighborhood that residents, business associates and visitors enjoy – and criminals avoid. Specifically, the group plans to make sustainable improvements to litter control and weed removal around the neighborhood’s commercial districts. Peggy Denby, Executive Director of Keep Atlanta Beautiful, (l) and John Wolfinger, Keep Virginia-Highland Beautiful member, apply a decal to the new garbage can at N. Highland and St. Charles avenues. While it’s working loosely with the VHCA’s Public Safety Committee chaired by John Wolfinger, the group currently has no formal ties to the civic association. Wolfinger explains why the group formed. Wolfinger says the inconsistency creates a poor public image and contributes to the “broken window” theory that says poorly maintained properties send an inviting message to criminals. Wolfinger points out that, while a few dedicated residents have taken it upon themselves to periodically clean up problem areas to supplement the efforts of many business owners, a more sustainable solution is needed. Stephenson points out that the group is just getting started and cautions not to expect dramatic change overnight. Anyone who shares the committee’s vision of creating a more sustainably beautiful Virginia-Highland is encouraged to get involved. Send an email to Stephenson at kay.stephenson@gmail.com or committee member Tim Langan at t_langan@hotmail.com and you’ll be kept up to date on group activities. If you have thoughts about how the committee can accomplish its goals, Stephenson says, include them in your email. VOICE tips its hat to the committee for checking the first item off its to-do list with placement of the new garbage can at N. Highland and St. Charles. We look forward to seeing more improvements in the weeks and months ahead. This entry was posted in news, voice (online edition) and tagged 2012, cleanups, keepatlantabeautiful, keepvirginiahighlandbeautiful, streetscape by Kay Stephenson. Bookmark the permalink.